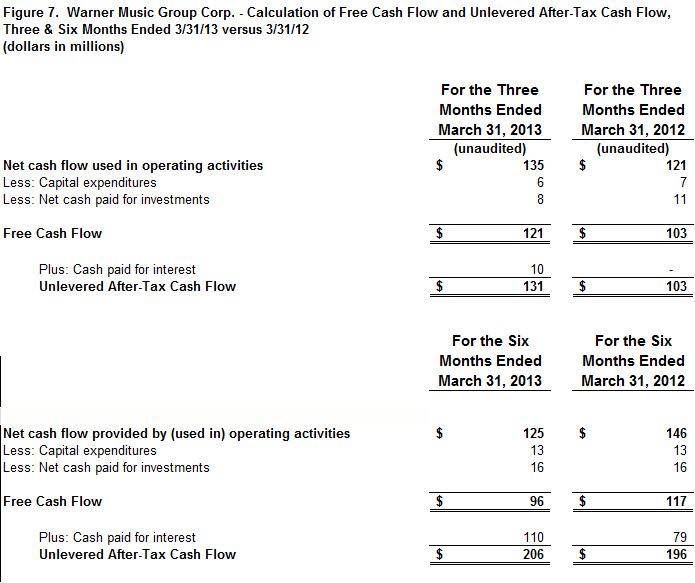 Warner Music Group Corp. today announced its fiscal second quarter financial results for the period ended March 31, 2013. For the quarter, revenue grew 8.3%, or 9.6% in constant currency. Physical and digital Recorded Music revenue, Recorded Music licensing revenue and Music Publishing digital and performance revenue all increased. Digital revenue represented 41.6% of total revenue for the quarter, compared to 37.7% in the prior-year quarter. The growth in digital revenue reflects growth in subscription and streaming revenue as well as download revenue. The growth in net income to $2 million this quarter compared to a net loss of $36 million in the prior-year quarter is largely attributable to the increase in operating income as well as the decline in interest expense to $49 million from $56 million as a result of the company’s November 2012 refinancing of certain indebtedness. 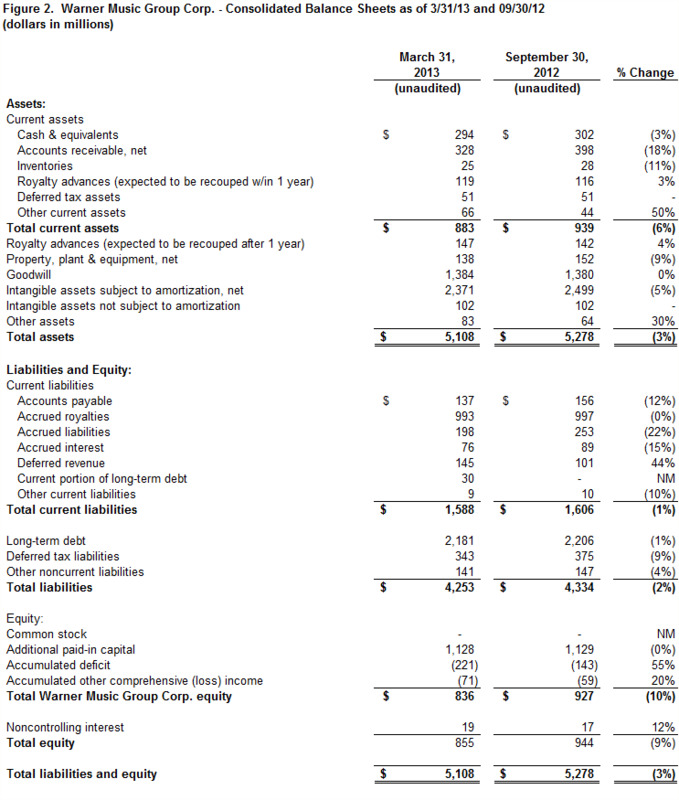 As of March 31, 2013, the company reported a cash balance of $294 million, total long-term debt of $2.211 billion (including the current portion) and net debt (total long-term debt minus cash) of $1.917 billion. Recorded Music revenue grew 11.0%, or 12.4% on a constant-currency basis. Physical and digital revenue were up 11.8% and 18.0%, respectively, due to a very strong release schedule and solid performances from carryover releases. Licensing revenue grew 10.6%. 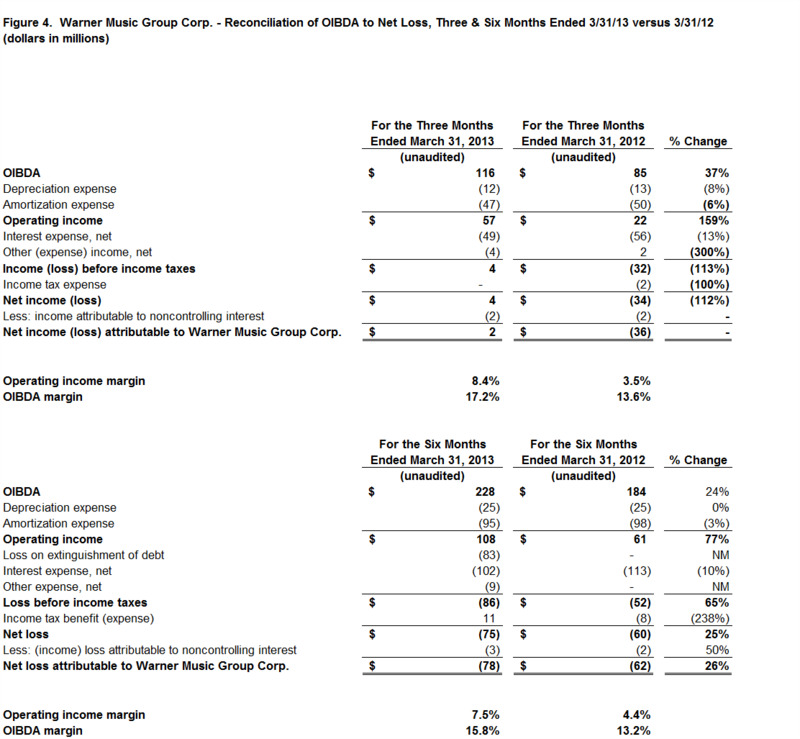 Artist Services and Expanded Rights revenue declined 16.7% due primarily to the timing of tours. Recorded Music digital revenue represented 47.3% of total Recorded Music revenue, compared to 44.5% in the prior-year quarter. Domestic Recorded Music digital revenue was $145 million, or 58.2% of total domestic Recorded Music revenue, compared to 59.4% in the prior-year quarter. Revenue growth in the U.S., U.K., France, Germany, Canada and Latin America was offset by declines in Japan, Italy and other parts of Asia and Europe. Major sellers included Bruno Mars, Josh Groban, fun., Ed Sheeran and Blake Shelton. Recorded Music operating margin expanded 6.7 percentage points to 8.3% from 1.6% in the prior-year quarter. 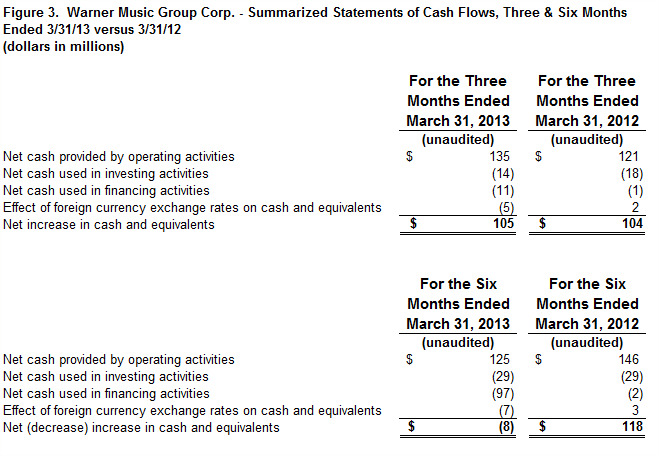 Recorded Music OIBDA margin expanded 5.9 percentage points to 15.7% from 9.8% in the prior-year quarter. OIBDA and OIBDA margin improvement were driven by the growth in revenue, the decrease in costs as a percentage of revenue and the continued transition from physical to digital sales. 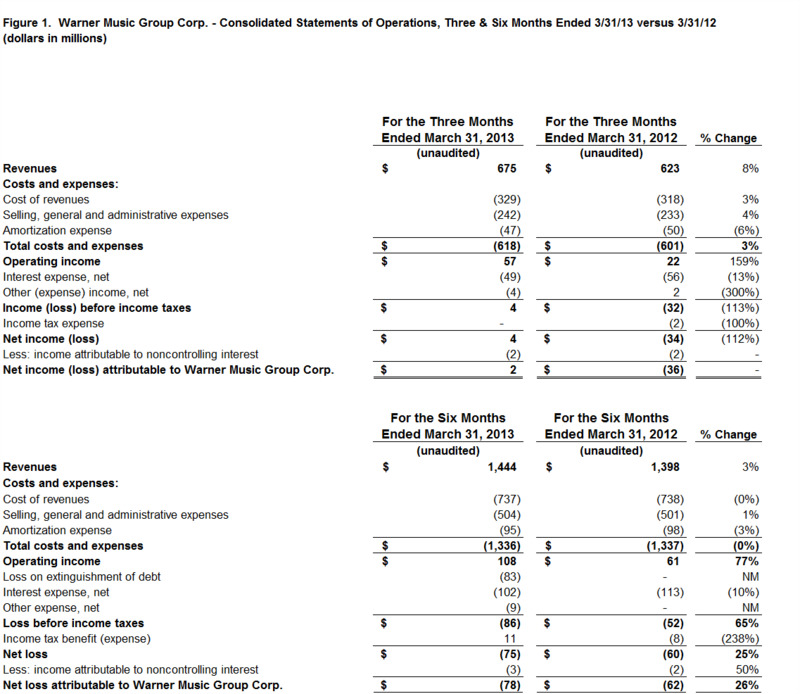 Music Publishing revenue was flat, and grew 0.8% on a constant-currency basis. The Digital revenue grew 50.0%, driven by increases in both subscription and streaming revenue and download revenue, and performance revenue grew 4.3%, due to recent investments in film and TV assets. This growth was offset by the expected decline in mechanical revenue of 15.6%, reflecting the continued transition from physical to digital sales, and a 15.6% decline in synchronization revenue, reflecting lower demand in commercials and video games. Music Publishing operating margin expanded 1.5 percentage points to 29.1% from 27.6% in the prior-year quarter. 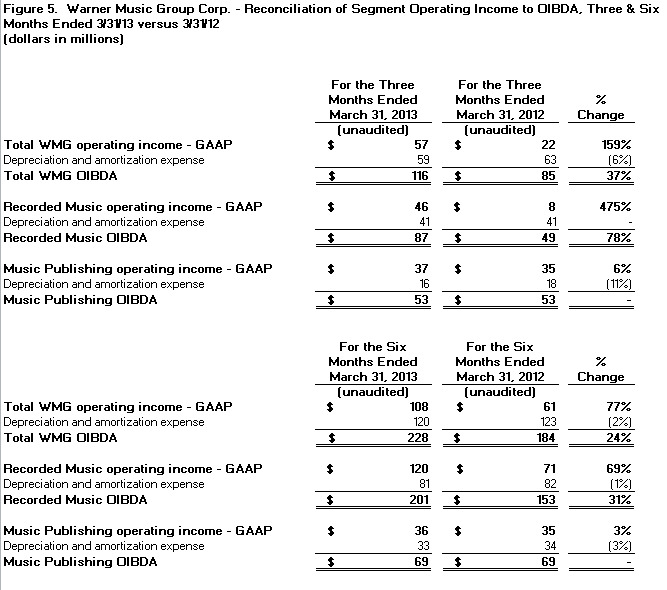 Music Publishing OIBDA margin was flat at 41.7%. Financial details for the quarter can be found in the company’s current Form 10-Q, for the period ended March 31, 2013, filed today with the Securities and Exchange Commission. With its broad roster of new stars and legendary artists, Warner Music Group is home to a collection of the best-known record labels in the music industry including Asylum, Atlantic, East West, Elektra, Fueled By Ramen, Nonesuch, Reprise, Rhino, Roadrunner, Rykodisc, Sire, Warner Bros. and Word, as well as Warner/Chappell Music, one of the world's leading music publishers, with a catalog of more than one million copyrights worldwide. OIBDA reflects our operating income before non-cash depreciation of tangible assets, non-cash amortization of intangible assets and non-cash impairment charges to reduce the carrying value of goodwill and intangible assets. We consider OIBDA to be an important indicator of the operational strengths and performance of our businesses, and believe the presentation of OIBDA helps improve the ability to understand our operating performance and evaluate our performance in comparison to comparable periods. However, a limitation of the use of OIBDA as a performance measure is that it does not reflect the periodic costs of certain capitalized tangible and intangible assets used in generating revenue in our businesses. Accordingly, OIBDA should be considered in addition to, not as a substitute for, operating income, net (loss) income and other measures of financial performance reported in accordance with GAAP. In addition, OIBDA, as we calculate it, may not be comparable to similarly titled measures employed by other companies. Because exchange rates are an important factor in understanding period-to-period comparisons, we believe the presentation of revenue on a constant-currency basis in addition to reported revenue helps improve the ability to understand our operating results and evaluate our performance in comparison to prior periods. Constant-currency information compares results between periods as if exchange rates had remained constant period over period. We use results on a constant-currency basis as one measure to evaluate our performance. We calculate constant-currency results by applying current-year foreign currency exchange rates to prior-year results. However, a limitation of the use of the constant-currency results as a performance measure is that it does not reflect the impact of exchange rates on our revenue, including, for example, the $7 million, $6 million and $1 million unfavorable impact of exchange rates on our Total, Recorded Music and Music Publishing revenue, in the three months ended March 31, 2013 compared to the prior-year quarter. These results should be considered in addition to, not as a substitute for, results reported in accordance with GAAP. Results on a constant-currency basis, as we present them, may not be comparable to similarly titled measures used by other companies and are not a measure of performance presented in accordance with GAAP. Free Cash Flow reflects our cash flow provided by operating activities less capital expenditures and cash paid or received for investments. We use Free Cash Flow, among other measures, to evaluate our operating performance. Management believes Free Cash Flow provides investors with an important perspective on the cash available to service debt, fund ongoing operations and working capital needs, make strategic acquisitions and investments and pay any dividends or fund any repurchases of our outstanding notes or common stock in open market purchases, privately negotiated purchases or otherwise. As a result, Free Cash Flow is a significant measure of our ability to generate long-term value. It is useful for investors to know whether this ability is being enhanced or degraded as a result of our operating performance. We believe the presentation of Free Cash Flow is relevant and useful for investors because it allows investors to view performance in a manner similar to the method used by management. In addition, Free Cash Flow is also a primary measure used externally by our investors and analysts for purposes of valuation and comparing our operating performance to other companies in our industry. Free Cash Flow includes cash paid for interest. We also review our cash flow adjusted for cash paid for interest, a measure we call Unlevered After-Tax Cash Flow. Management believes this measure provides investors with an additional important perspective on our cash generation ability. We consider Unlevered After-Tax Cash Flow to be an important indicator of the performance of our businesses and believe the presentation is relevant and useful for investors because it allows investors to view performance in a manner similar to the method used by management. A limitation of the use of this measure is that it does not reflect the charges for cash interest and, therefore, does not necessarily represent funds available for discretionary use, and is not necessarily a measure of our ability to fund our cash needs. Accordingly, this measure should be considered in addition to, not as a substitute for, net cash flow provided by operating activities and other measures of liquidity reported in accordance with GAAP.